Generalized anxiety disorder (GAD) is a mental disorder in which a person is often worried or anxious about many things and finds it hard to control this anxiety. If you feel anxious all the time for no reason, you should think about talking with your health care provider. The correct answer is true. Excessive worry may be a sign of an anxiety disorder. You may have an anxiety disorder if you can't control your worry about everyday problems such as work, relationships, money, or health. Talk with your doctor, if worry interferes with your job, home life, or activities you enjoy. 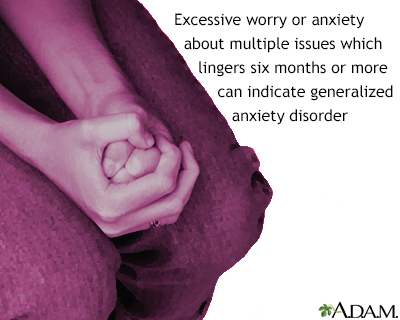 Anxiety can also cause physical symptoms. The correct answer is true. Along with constant worry, your muscles may feel tense, or you may headaches and stomach problems such as nausea and diarrhea. Your doctor may do tests to see whether other medical problems could be causing these symptoms. The correct answer is all of the above. Panic attacks are sudden bouts of terror that peak within 20 minutes. They can be so intense that you live in fear of the next one, and you may avoid things you think may trigger another attack. This can cause you to change how you live your life, so it's best to get help soon. A panic attack may seem like a heart attack. The correct answer is true. A panic attack can cause chest pain, a racing heart, and shortness of breath. Many people with this condition first seek treatment in the emergency room, because the panic attack feels like a heart attack. Post-traumatic stress disorder (PTSD) is a type of anxiety disorder. The correct answer is true. Post-traumatic stress disorder is a type of anxiety disorder. It can occur after you've experienced a traumatic event involving injury or death. It can cause repeated nightmares, feelings of detachment, flashbacks, and feeling hyper aware of your surroundings, along with other anxiety symptoms. PTSD only happens to war veterans. The correct answer is false. While it does occur in some vets, PTSD can occur in anyone who has experienced trauma. PTSD changes the body's response to stress. No one knows why some people develop PTSD and others don't. See your doctor right away if you think you have PTSD. Early treatment has the best chance of success. The correct answer is all of the above. Most people will feel some anxiety right after these types of events. With PTSD, symptoms continue for at least 30 days. But don't wait to seek help. Call your doctor right away if you feel out of control, feel like hurting yourself or others, or have other symptoms of PTSD such as those in question 5. The correct answer is obsessive-compulsive disorder (OCD). People with OCD have unwanted and repeated thoughts or behaviors. This may include counting constantly or washing your hands over and over. Treatment can help, so tell your doctor if your symptoms interfere with daily life, work, or relationships. Social phobia is just another term for shyness. The correct answer is false. People with social phobia have an intense fear of being judged. They may avoid going to parties, meeting new people, or speaking in public. They can worry for days or weeks about an upcoming event. This fear may interfere with ordinary activities and can make it hard to make and keep friends. Antidepressants can help treat anxiety disorders. The correct answer is true. Antidepressants can help treat many types of anxiety problems. Other medicines also may help. Your doctor can determine which treatment is best for you. Medicine is the only effective treatment for anxiety disorders. The correct answer is false. A type of talk therapy called cognitive-behavioral therapy can help you change thoughts or behaviors that cause anxiety. You may also learn new ways to react to symptoms of anxiety. Support groups may be helpful for some types of anxiety. Exercise, rest, and eating healthy can also help you feel better. The cause of GAD is unknown. Genes may play a role. Stress may also contribute to the development of GAD. GAD is a common condition. Anyone can develop this disorder, even children. GAD occurs more often in women than in men. 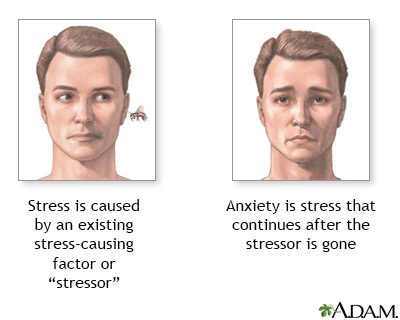 The main symptom is frequent worry or tension for at least 6 months, even when there is little or no clear cause. Worries seem to float from one problem to another. Problems may involve family, other relationships, work, school, money, and health. Even when aware that worries or fears are stronger than appropriate for the situation, a person with GAD still has difficulty controlling them. The person may also have other physical symptoms. These can include muscle tension, upset stomach, sweating, or difficulty breathing. There is no test that can make a diagnosis of GAD. The diagnosis is based on your answers to questions about the symptoms of GAD. Your health care provider will ask about these symptoms. You will also be asked about other aspects of your mental and physical health. A physical exam or lab tests may be done to rule out other conditions that cause similar symptoms. The goal of treatment is to help you feel better and function well in daily life. Talk therapy or medicine alone can be helpful. Sometimes, a combination of these may work best. Understand and gain control of distorted views of stressors, such as other people's behavior or life events. Recognize and replace panic-causing thoughts to help you feel more in control. Manage stress and relax when symptoms occur. Avoid thinking that minor problems will develop into terrible ones. Other types of talk therapy may also be helpful in managing symptoms of an anxiety disorder. Certain medicines, usually used to treat depression, may be very helpful for this disorder. They work by preventing your symptoms or making them less severe. You must take these medicines every day. DO NOT stop taking them without talking with your provider. Medicines called sedatives or hypnotics may also be prescribed. These medicines should only be taken under a doctor's direction. Your doctor will prescribe a limited amount of these drugs. They should not to be used everyday. They may be used when symptoms become very severe or when you are about to be exposed to something that always brings on your symptoms. If you are prescribed a sedative, do not drink alcohol while on this medicine. You can ease the stress of having GAD by joining a support group. Sharing with others who have common experiences and problems can help you not feel alone. Support groups are usually not a good substitute for talk therapy or taking medicine, but can be a helpful addition. How well a person does depends on how severe the condition is. In some cases, GAD is long-term and is difficult to treat. Most people, though, get better with medicine and/or talk therapy. Depression and substance abuse may occur with an anxiety disorder. Call your provider if you frequently worry or feel anxious, especially if it interferes with your daily activities. American Psychiatric Association. Anxiety disorders. In: American Psychiatric Association. Diagnostic and Statistical Manual of Mental Disorders. 5th ed. Arlington, VA: American Psychiatric Publishing. 2013;189-234. Lyness JM. Psychiatric disorders in medical practice. In: Goldman L, Schafer AI, eds. Goldman-Cecil Medicine. 25th ed. Philadelphia, PA: Elsevier Saunders; 2016:chap 397. Physical activity and relaxation techniques can help reduce stress and anxiety. Proper nutrition can also help the body to handle stress better by keeping it running optimally. If stress becomes unmanageable, there are professional individuals such as licensed social workers and psychologists who are trained to help people deal with their stress and anxiety. Generalized anxiety disorder is characterized by excessive worry about 2 or more life circumstances for a period of 6 months or longer. Biological and genetic factors may combine with stress to produce psychological symptoms. Reviewed By: Fred K. Berger, MD, addiction and forensic psychiatrist, Scripps Memorial Hospital, La Jolla, CA. Also reviewed by David Zieve, MD, MHA, Medical Director, Brenda Conaway, Editorial Director, and the A.D.A.M. Editorial team.